The Five Dynasties and Song periods witnessed a gradual shift in painting subject matter in favor of landscapes. In earlier dynasties landscapes were more often the settings for human dramas than primary subject matter. During the tenth and eleventh centuries, several landscape painters of great skill and renown produced large-scale landscape paintings, which are today considered some of the greatest artistic monuments in the history of Chinese visual culture. These landscape paintings usually centered on mountains. Mountains had long been seen as sacred places in China--the homes of immortals, close to the heavens. Philosophical interest in nature could also have contributed to the rise of landscape painting, including both Daoist stress on how minor the human presence is in the vastness of the cosmos and Neo-Confucian interest in the patterns or principles that underlie all phenomena, natural and social. The essays that have been left by a handful of prominent landscape painters of this period indicate that pictures of mountains and water (shan shui, the literal translation of the Chinese term for landscape) were heavily invested with the numinous qualities of the natural world. Landscape paintings allowed viewers to travel in their imaginations, perhaps the natural antidote to urban or official life. 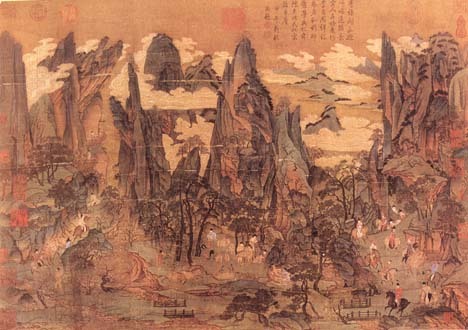 Landscape painting was not entirely new to the Five Dynasties and Song. 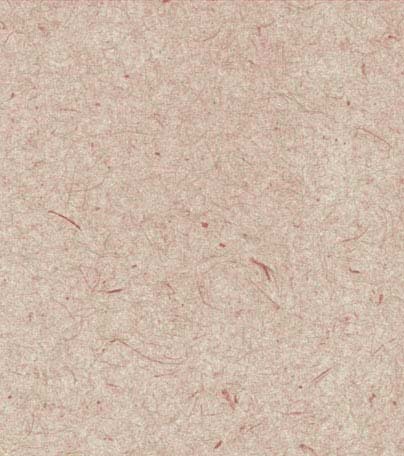 Most of the landscapes painted during the Tang, such as the one above, were executed in blue and green mineral-based pigments, which gave the painting surface a jewel-like quality. Can you see the mountains in this painting as the homes of immortals?